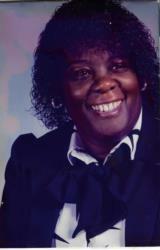 WILLIAMS - Barbara Jean Williams, a resident of Jacksonville, FL passed away on Jan 2, 2019. She is survived by her loving and devoted children Aaron Williams and Tiffany Greene (Phillip) along with a host of other family and friends. Funeral Service will be held Sat, Jan 5, 2019 at 10AM at St. Stephen A.M.E. Church, 913 W. 5th St., Dr. David W. Greene Sr., Pastor. Visitation of family and friends will be held at the church on Fri from 4 -7PM. Arrangements entrusted to the MIXON TOWN CHAPEL of Q.L. Douglas Funeral Home, 2403 Edison Ave.